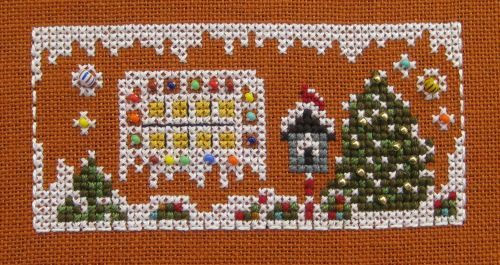 This is my latest project – I fancied doing some cross stitch, as I hadn’t done any for a while, and I’ve had the series of charts of these gingerbread buildings from Victoria Sampler in Canada for over a year in my stash. 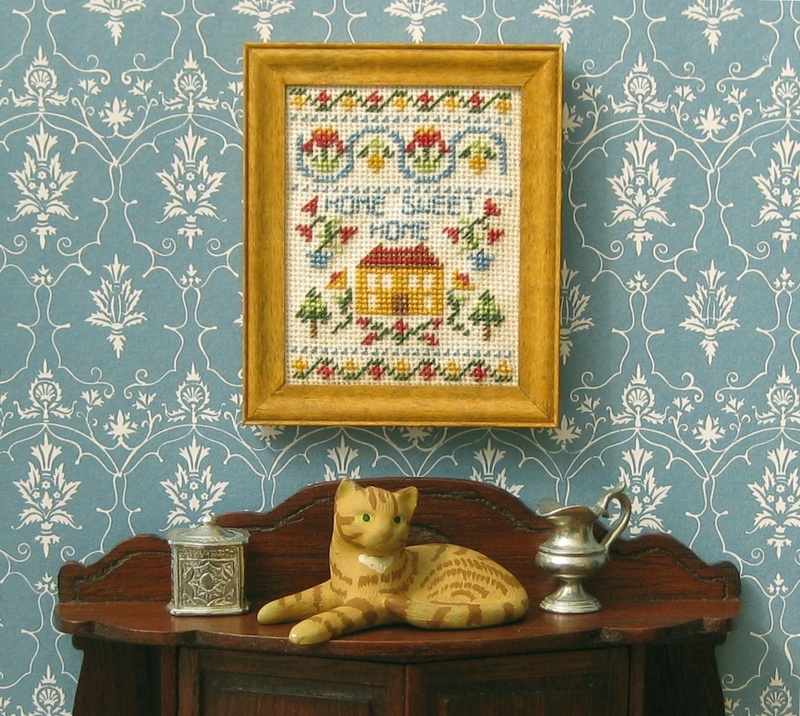 (If you’re in the UK, get the charts from Sew and So, and save hugely on postage costs, by the way!). 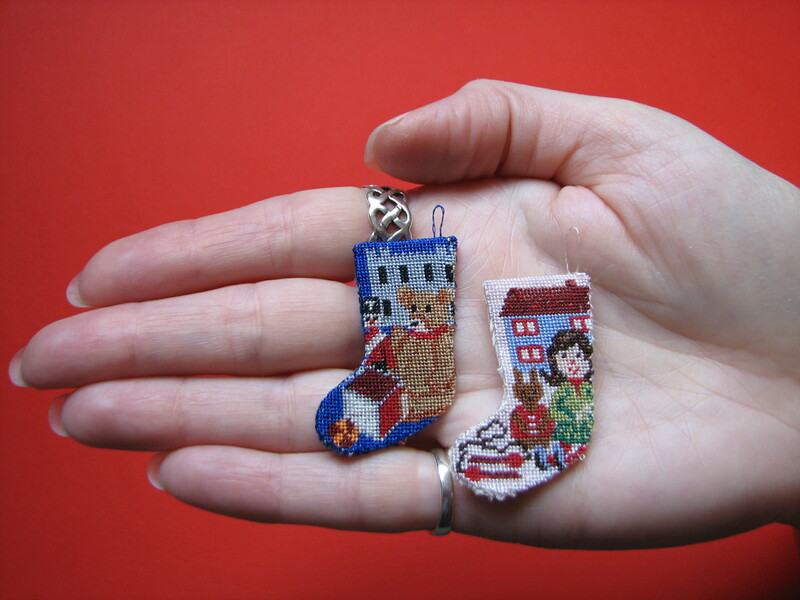 They are sold as items to be used as table decorations at Christmas, but I plan to display them all year round (once they’re done, of course, which may take a while…..). 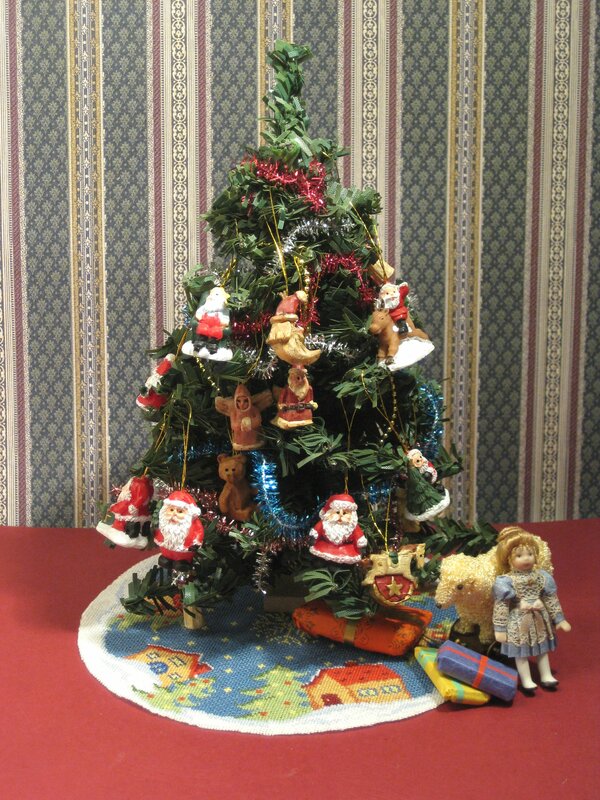 At this time of year, it’s so tempting to do something festive and fun! 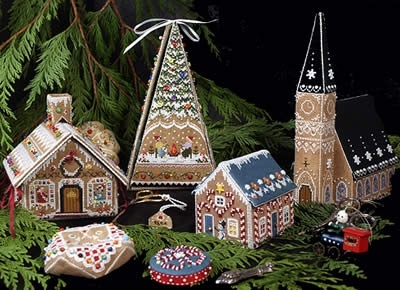 I am making the little house on the far left, to start with. 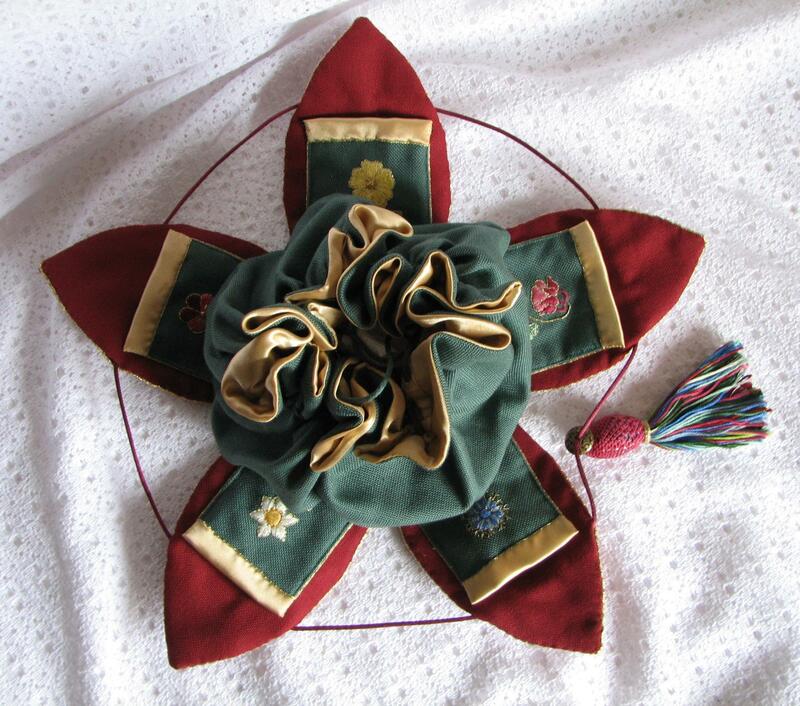 The biscornu in front of it is part of the chart pack as well. 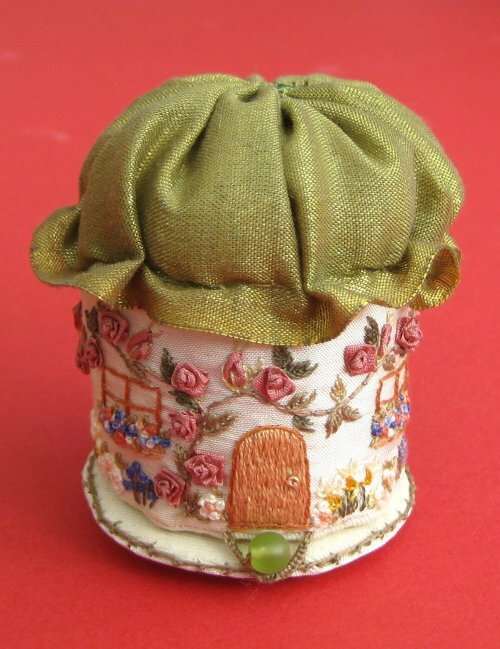 I decided to make the little stitching house first, as it’s not just a 3D building, but an etui. 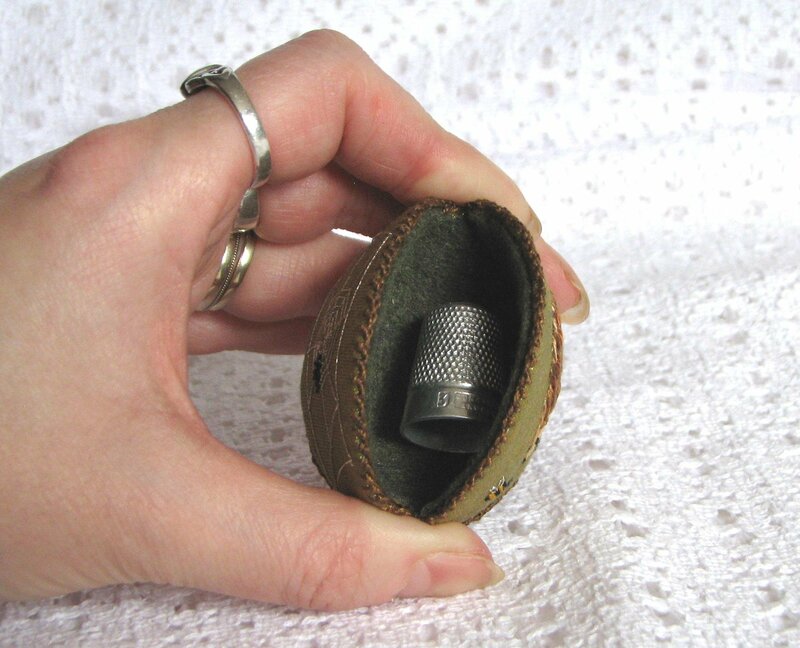 The roof lifts off to show that the underside of the roof is for storing needles. 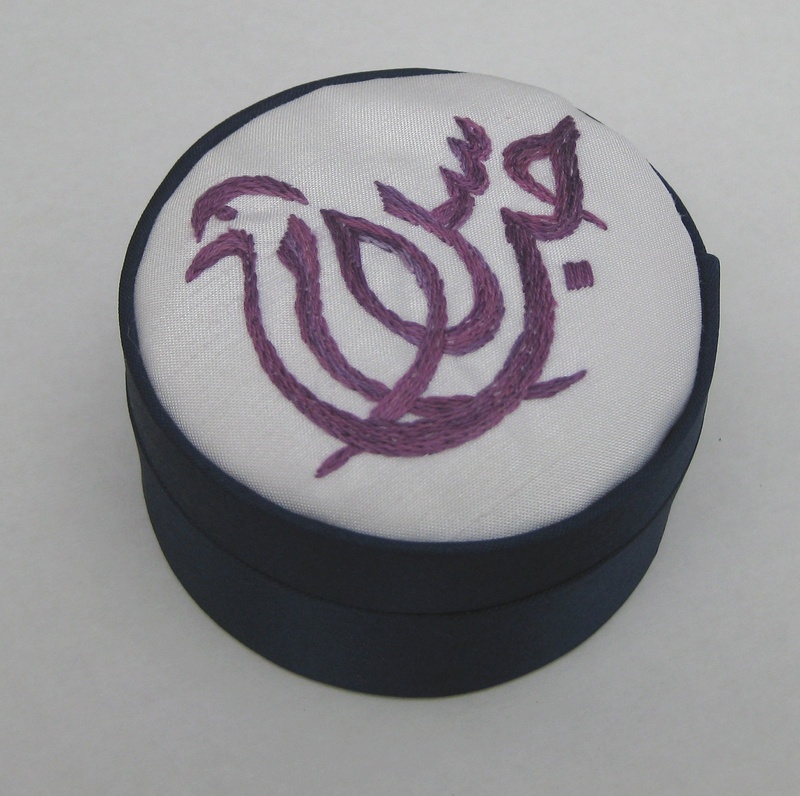 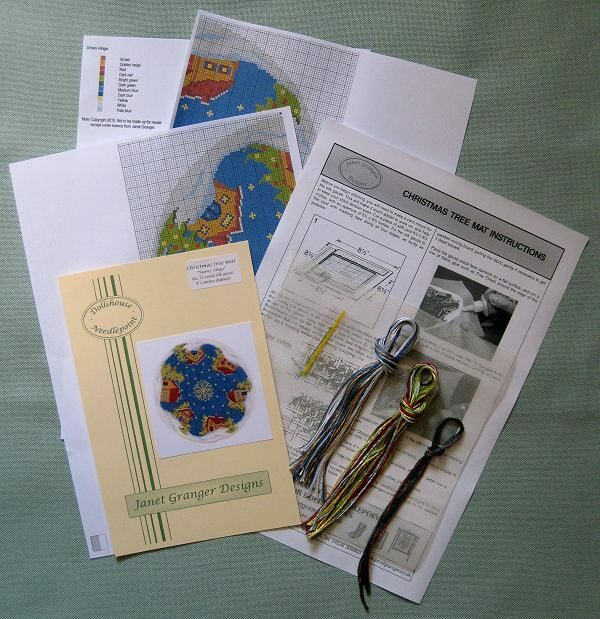 The chart pack has instructions for a scissor keep and a pincushion biscornu, too. 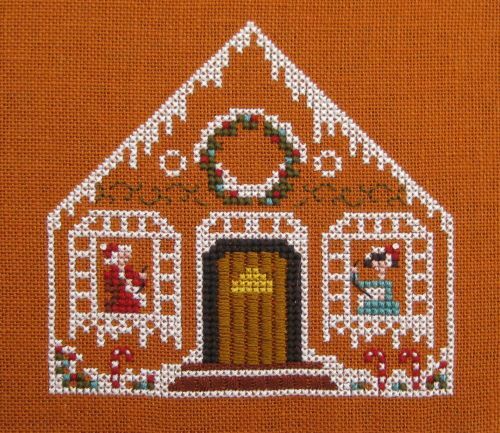 I began by stitching the front of the house, which was nice to do as there are lots of little areas that can be completed in a single stitching session, and the little trims (the beads and buttons) make it interesting to do. 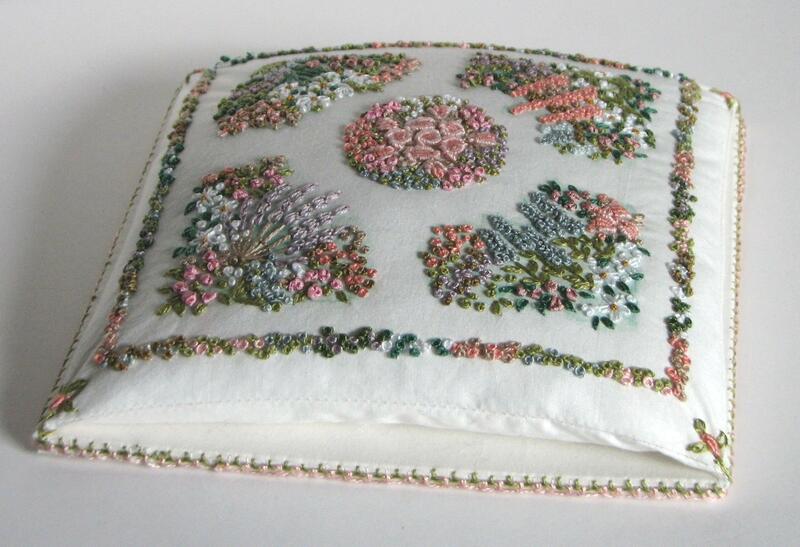 The fabric that is recommended in the instructions is Antique Almond, by Zweigart, but even though the chart pack was published fairly recently, that shade of fabric is already no longer produced. 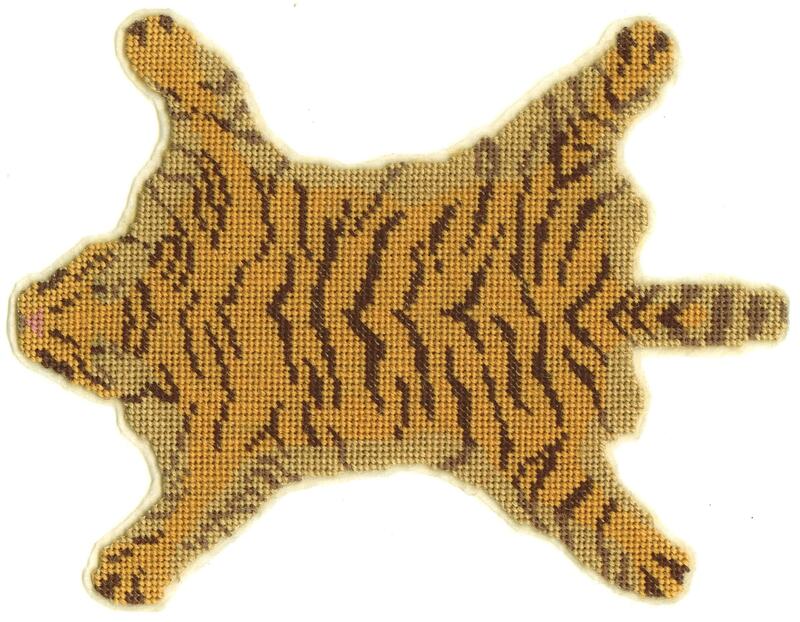 So, I bought Zweigart’s ‘Cognac’ shade instead. 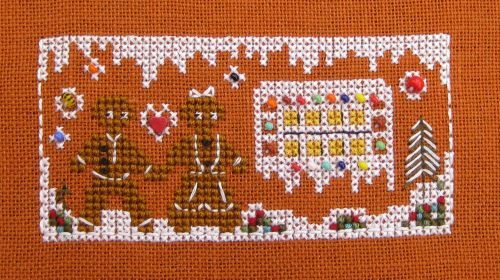 It’s a lot darker and orangey, but I like it. 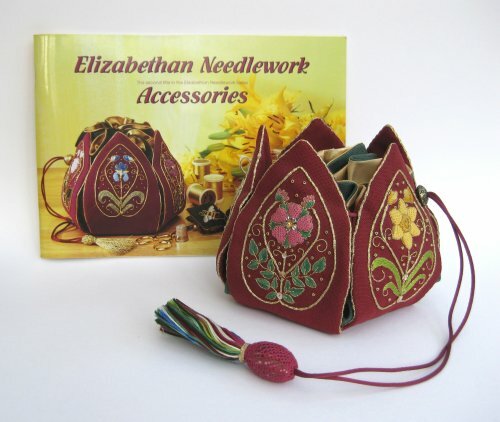 I was a bit concerned that the brown shades of thread in the Victoria Sampler Accessory Pack might not show up properly on the darker fabric (i.e. 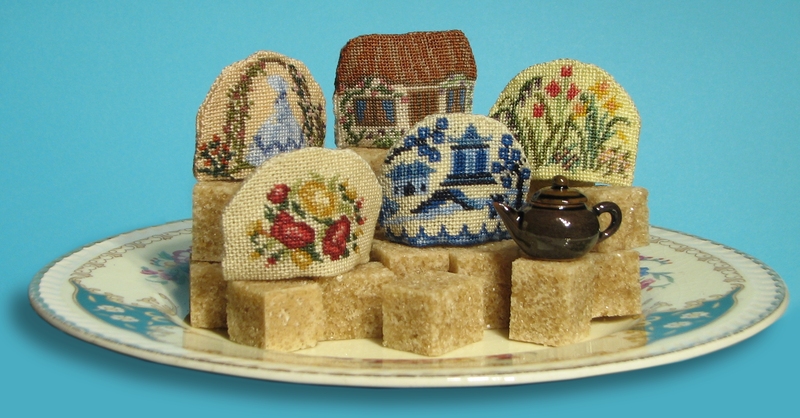 for the gingerbread people), but they did. 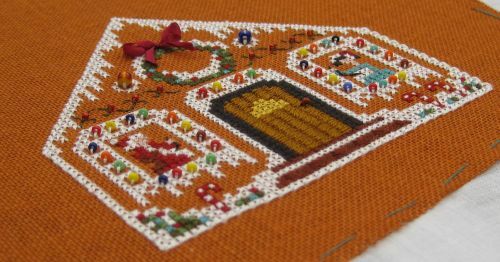 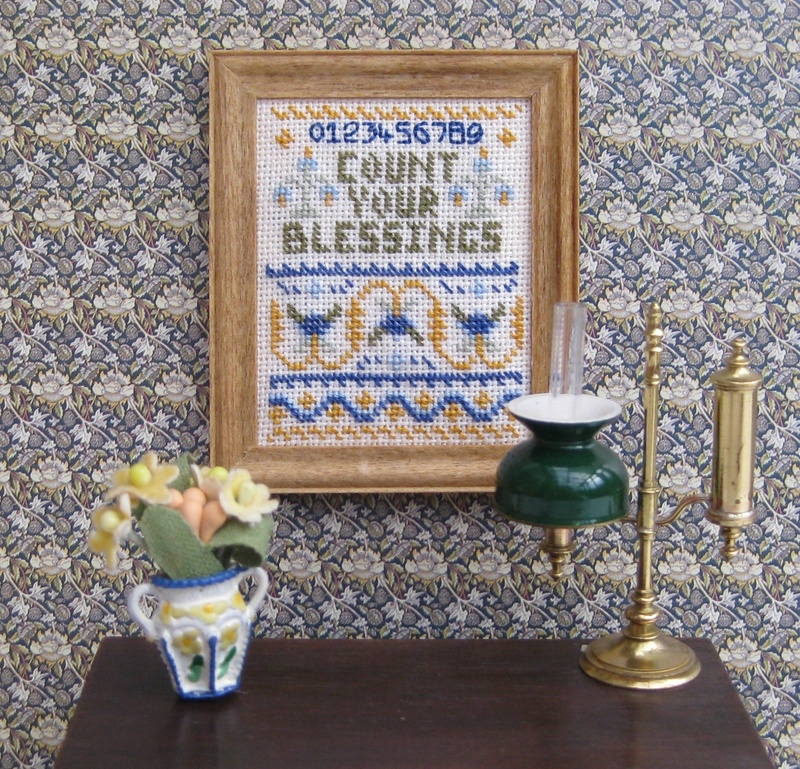 This is not just cross stitch – there are some interesting counted thread stitches incorporated, too, such as for the doorstep and door itself, to give textural interest. 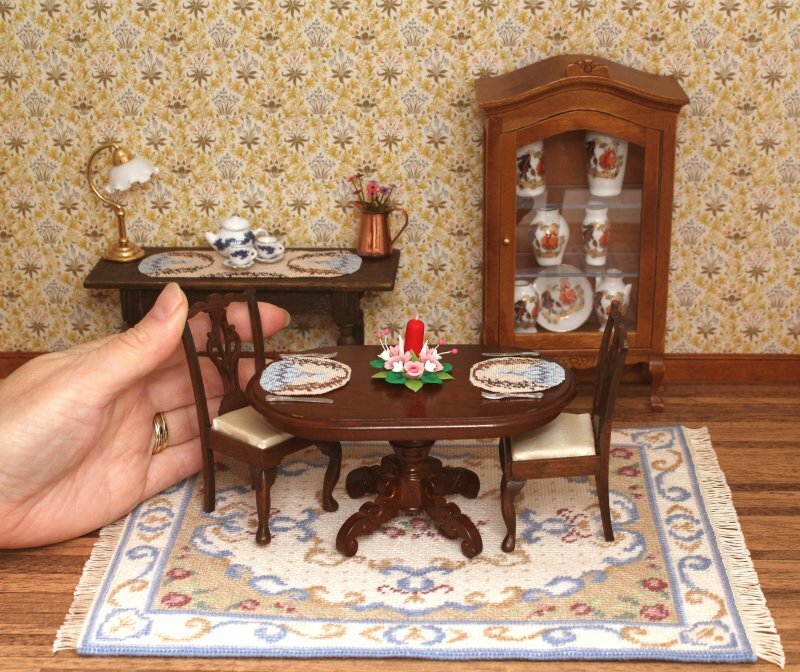 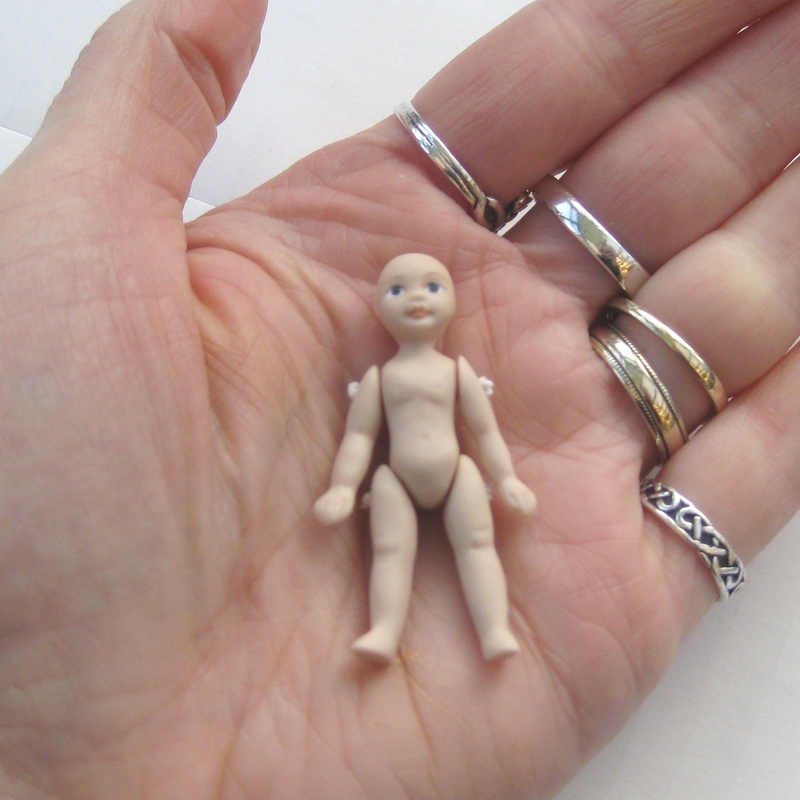 Would you like to make a table runner and placemats for your dollhouse? 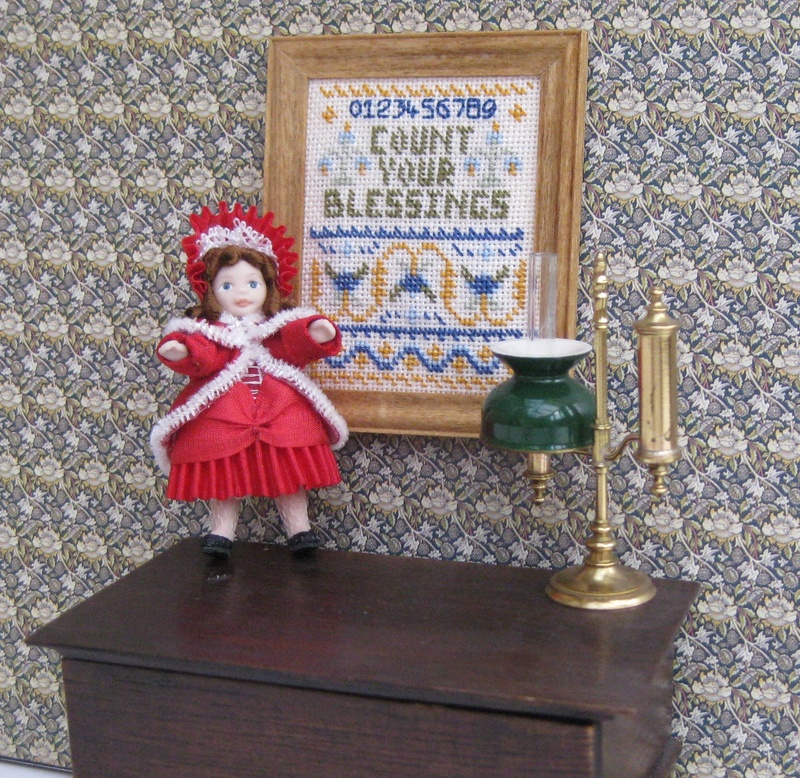 These are the latest table runner and placemat kits that I have launched for twelfth scale doll’s houses. 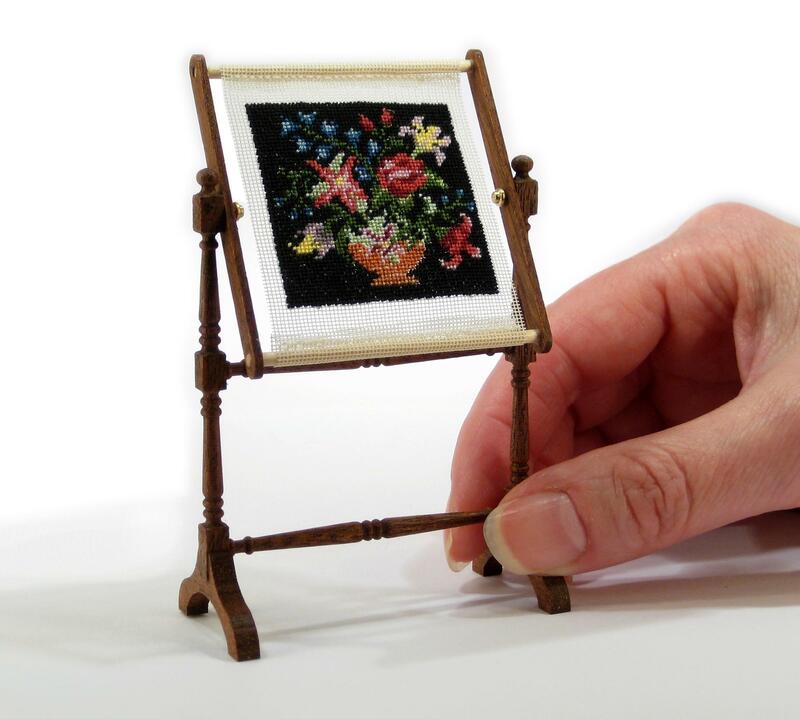 They are based on the most popular motif that I have in my range of miniature needlepoint, which is called ‘Summer Roses’. 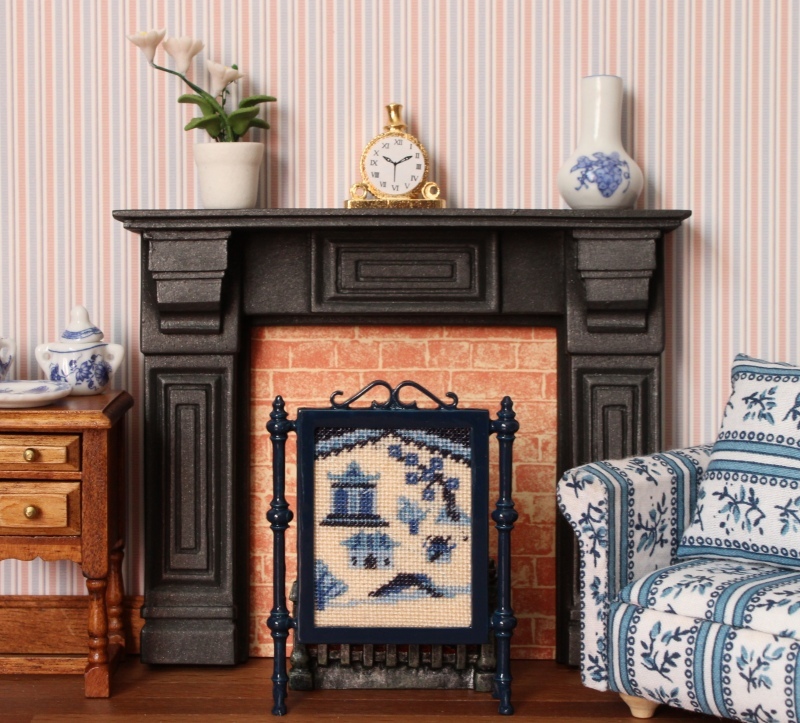 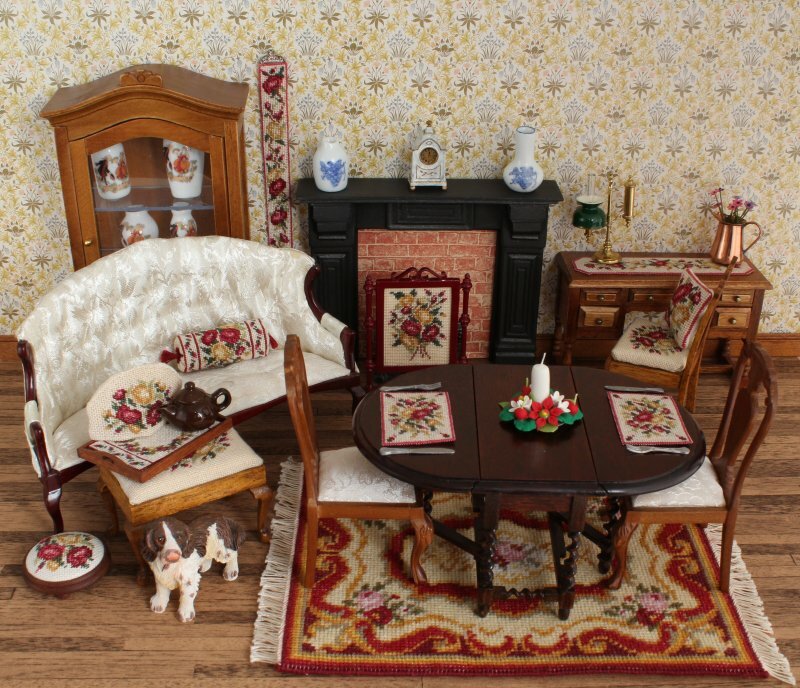 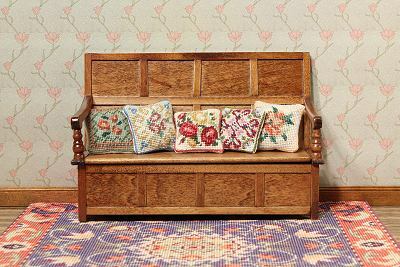 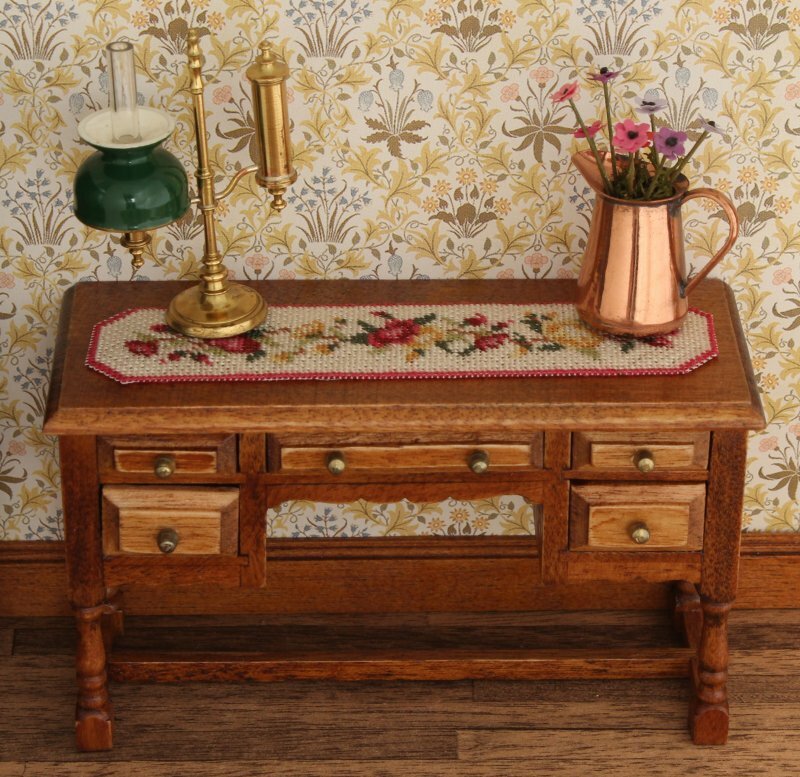 Although the motif itself is based on a Victorian design, it suits almost any era of doll’s house – even up to the present day – as flowers are timeless. 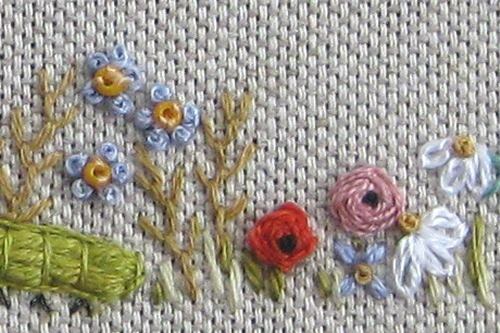 Both the table runner and the placemats are to be stitched on 32 count silk gauze, in tent stitch, which is really easy to do (it’s like half cross stitch). 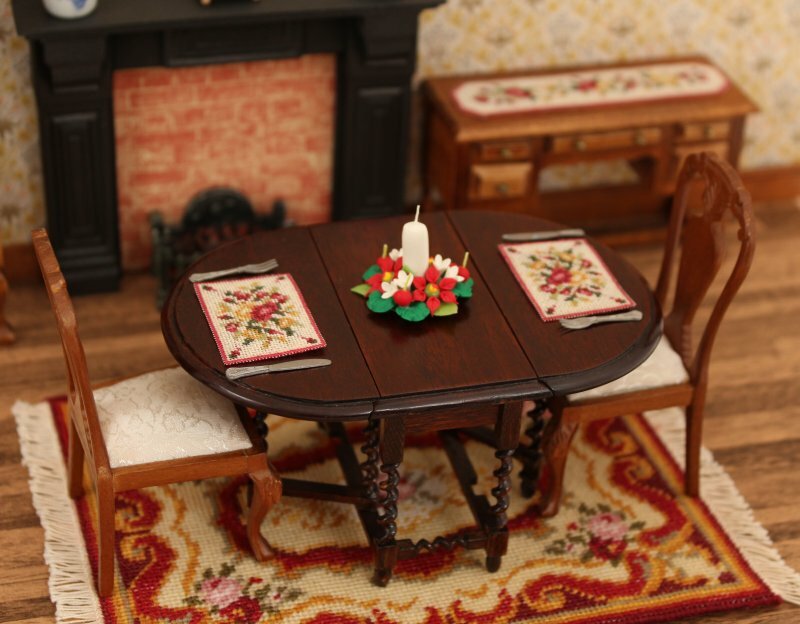 The placemats are 1 3/8 inches across by an inch high, and the table runner is 3 1/2 inches long by 7/8 inches wide. 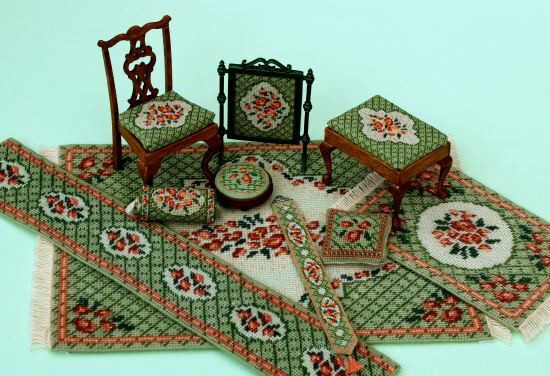 The kit for the placemats contains enough materials to make four placemats. 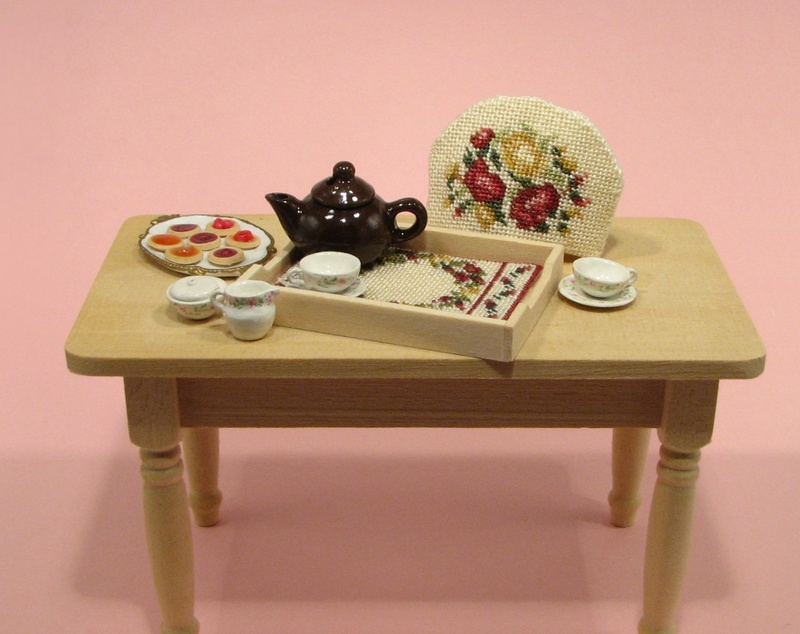 The placemats kit can be found here and costs £14.95, and the table runner kit can be found here and costs £12.95. 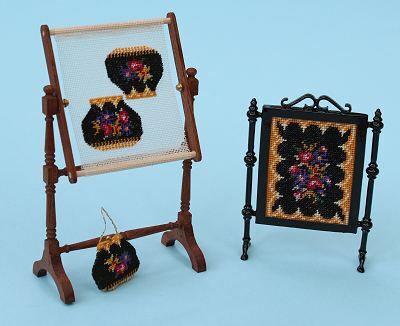 There are tutorials on how to make up each of these types of kit on my website here. 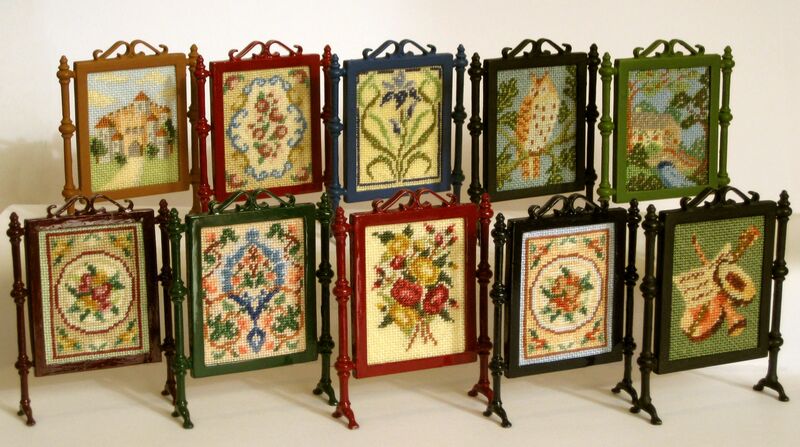 Author Janet GrangerPosted on November 20, 2014 November 13, 2014 Categories Placemats, Table runnersTags Cross stitch, Dollhouse, Embroidery, Miniature, Needlepoint, Placemat, Silk gauze, Summer roses, Table runner2 Comments on Would you like to make a table runner and placemats for your dollhouse? 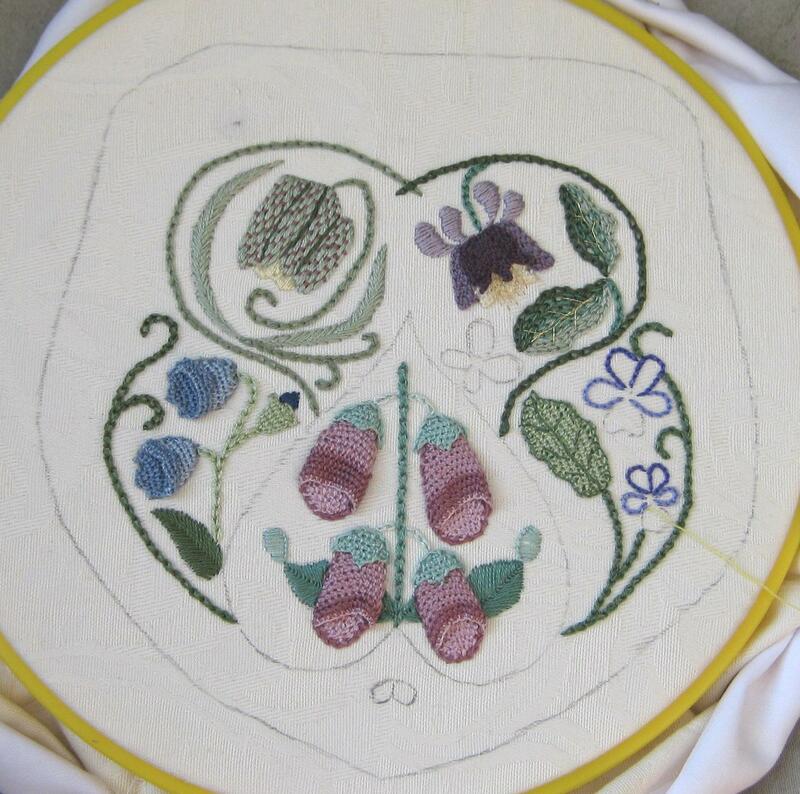 The flowers around the sides of the spoolholder that I am making from Carolyn Pearce’s ‘Home Sweet Home Workbox’ book are coming along nicely now. 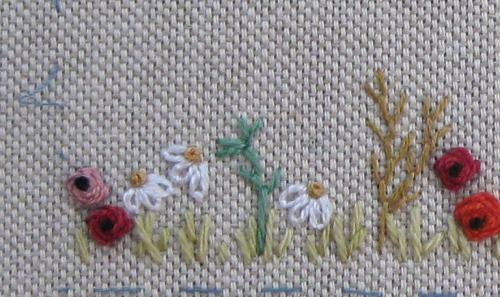 These daisies are stitched by working three lazy daisy stitches in a group, all starting from roughly the same point. 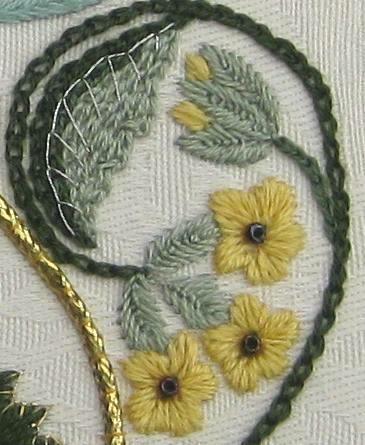 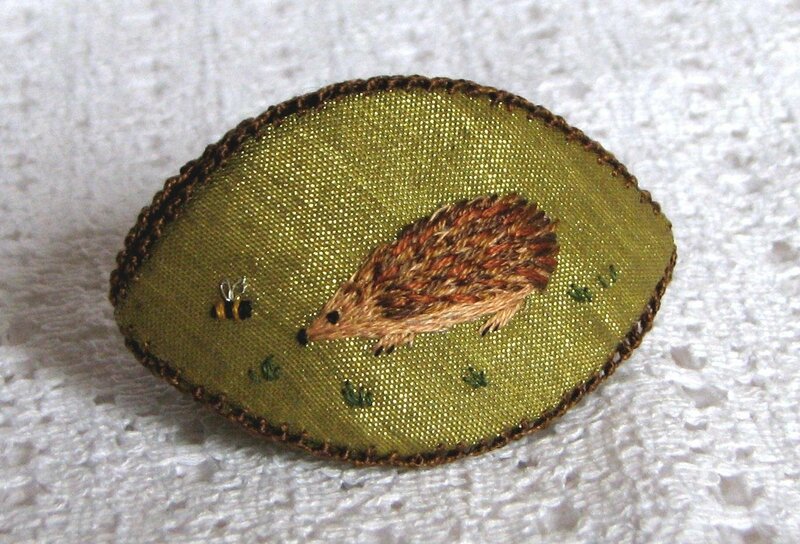 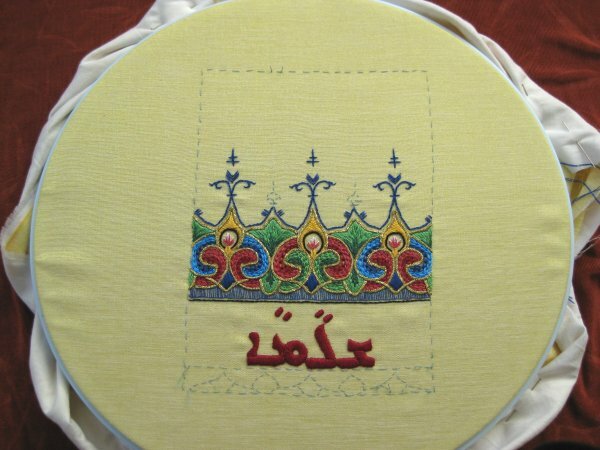 The centre of each is a French knot, made with two strands and two wraps around a milliners needle. 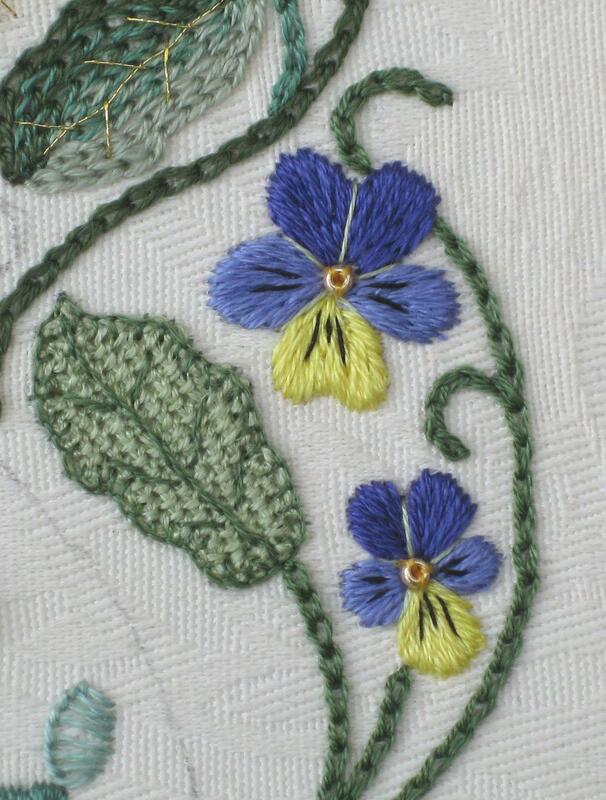 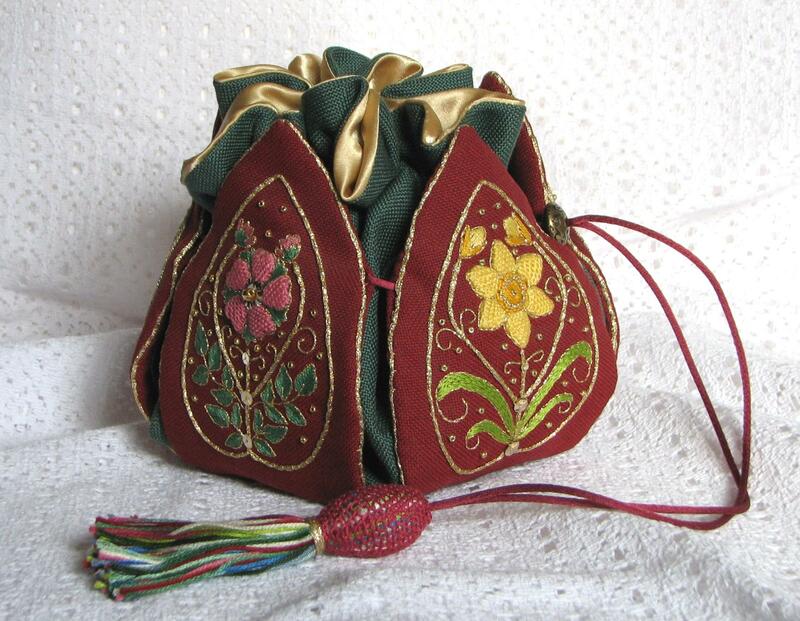 The forget-me-nots are worked by stitching four granitos stitches, leaving a tiny space in the centre for another French knot. 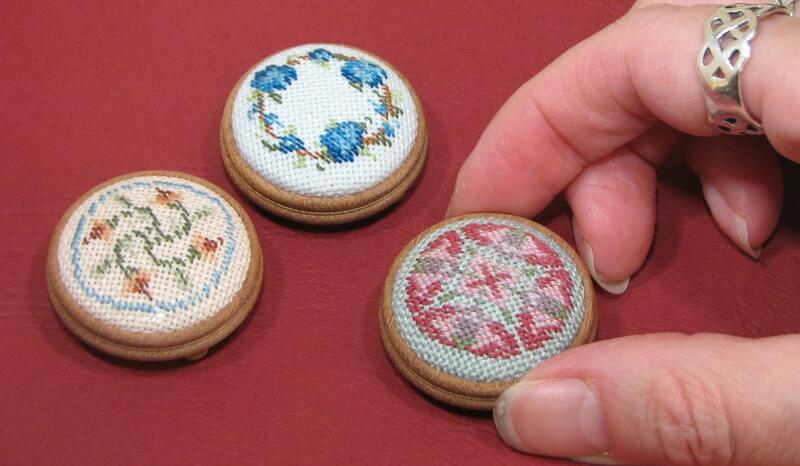 Lastly, these little blue flowers are worked by stitching five French knots in a circle, and then filling the centre of the circle with a butter-coloured Mill Hill size 11 seed bead. 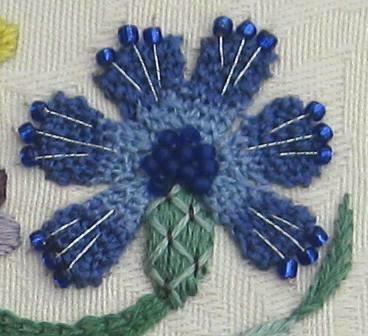 In Carolyn’s book, she suggested using blue flower beads for these flowers. 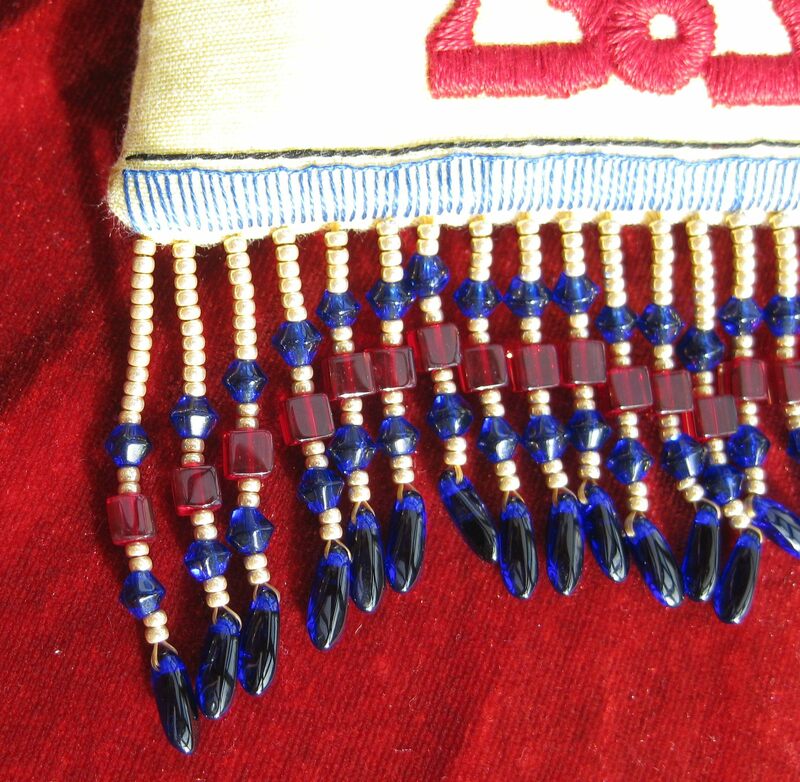 For one thing, I have found it impossible to buy anything remotely like the beads that Carolyn used. 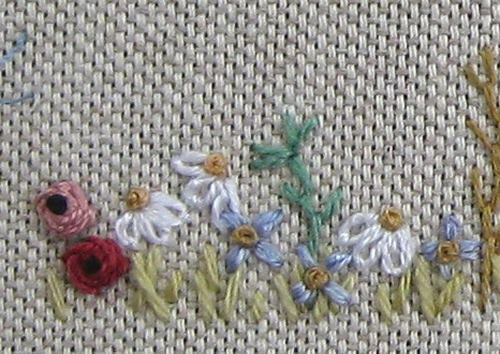 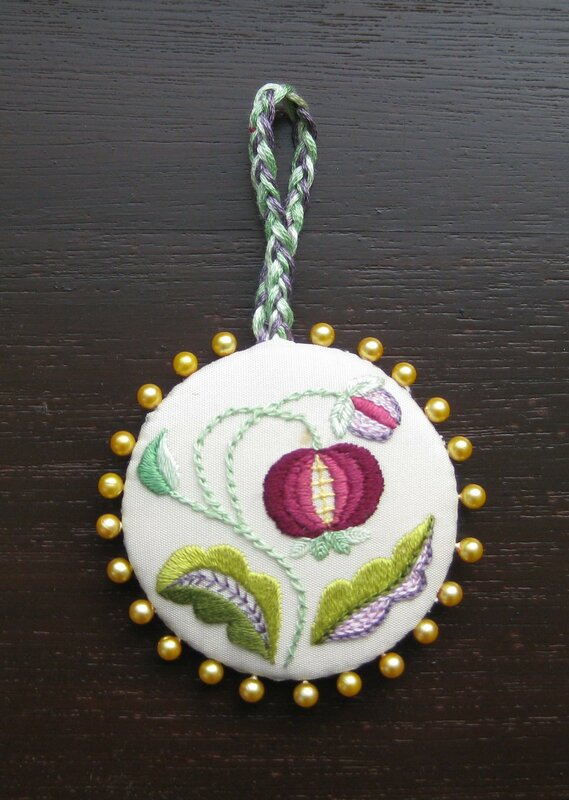 Also, I prefer the softer look of these flowers worked mainly in French knots, to possibly chunky-looking beads. 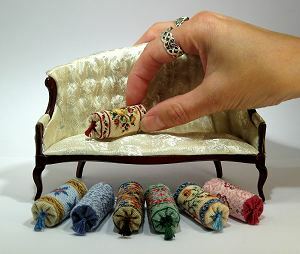 The strange green thing on the left of the image above is the back end of the caterpillar! 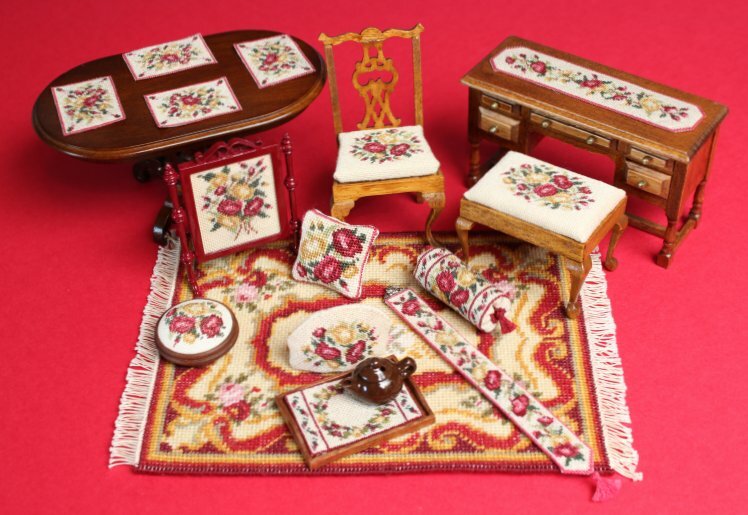 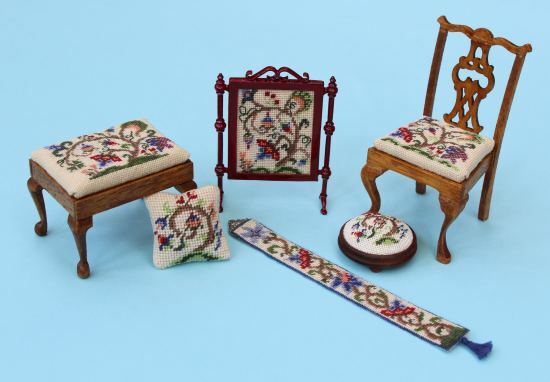 New 1930s style dollhouse needlepoint table runner and placemat sets to make! 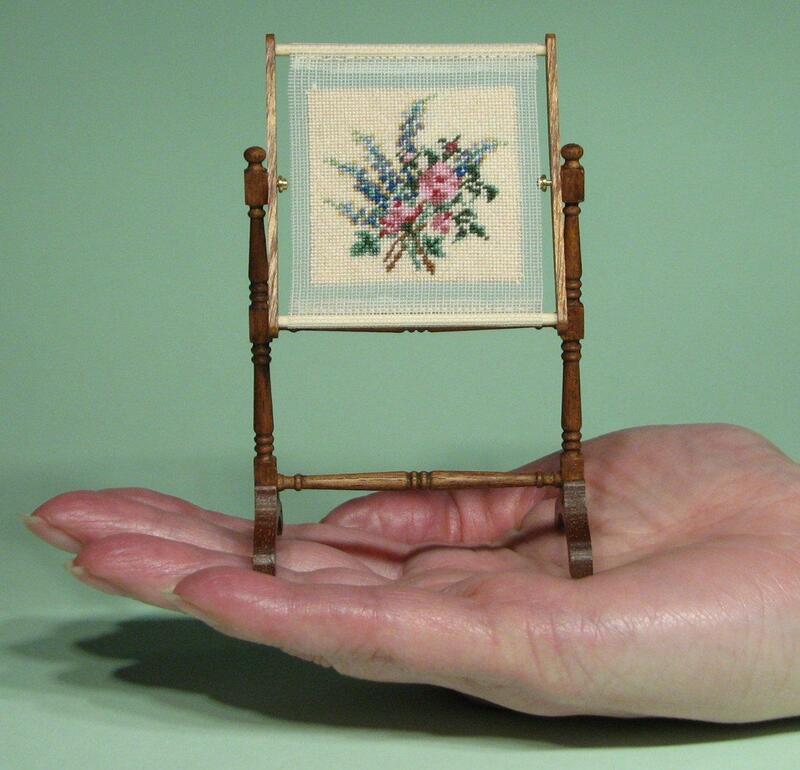 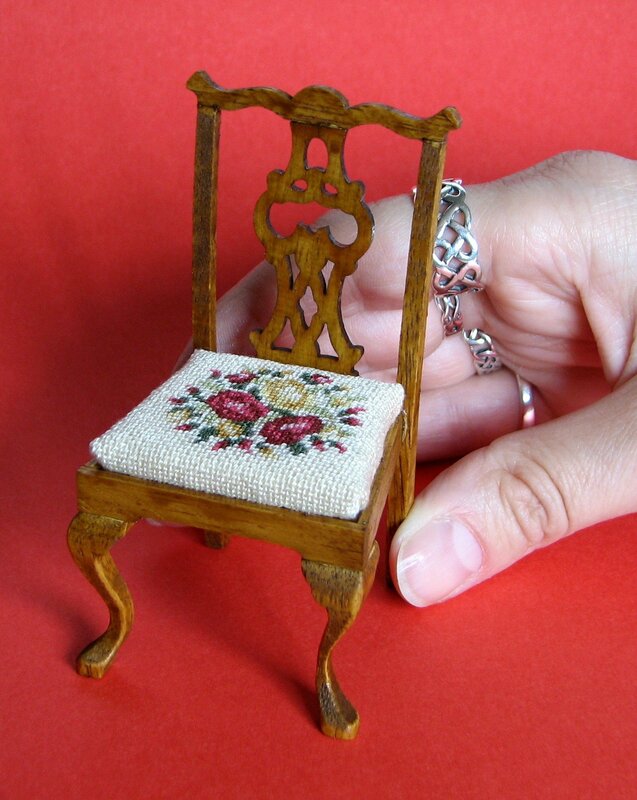 How would you like to make some stunning table linens for your doll’s house? 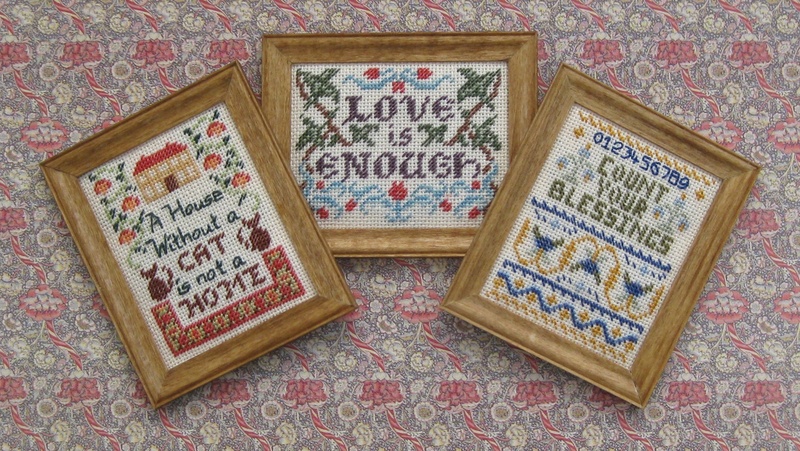 These are the latest table runner and placemats sets that I have launched for those of you who love to stitch miniature needlepoint. 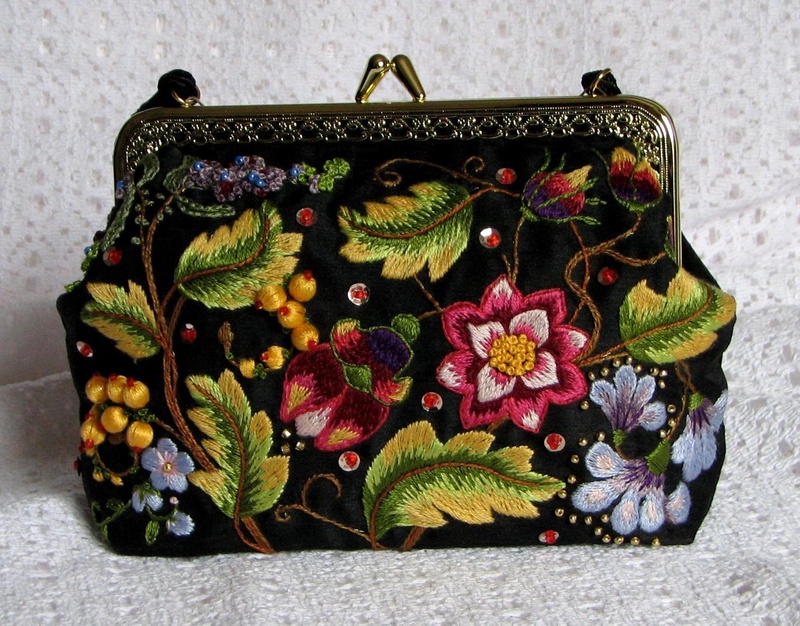 They are based on a really popular motif from the 1930’s – the Crinoline Lady. 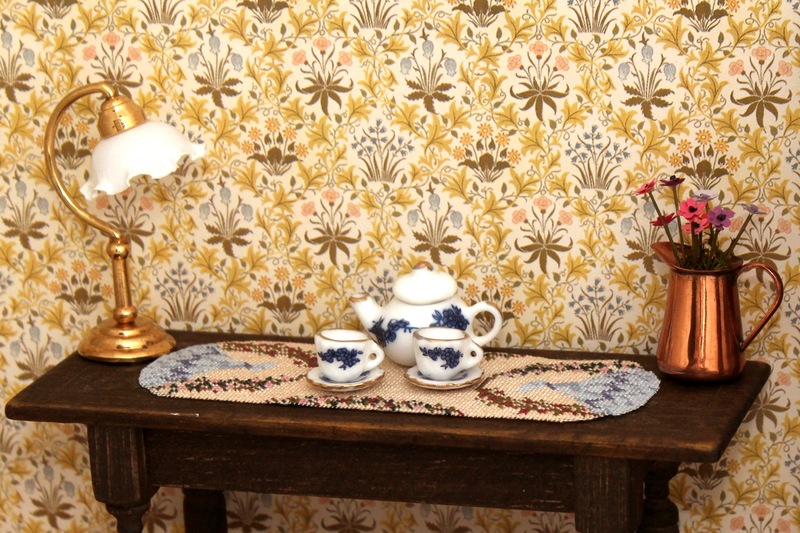 This motif appeared on all kinds of household linens during the decade of the 1930’s. 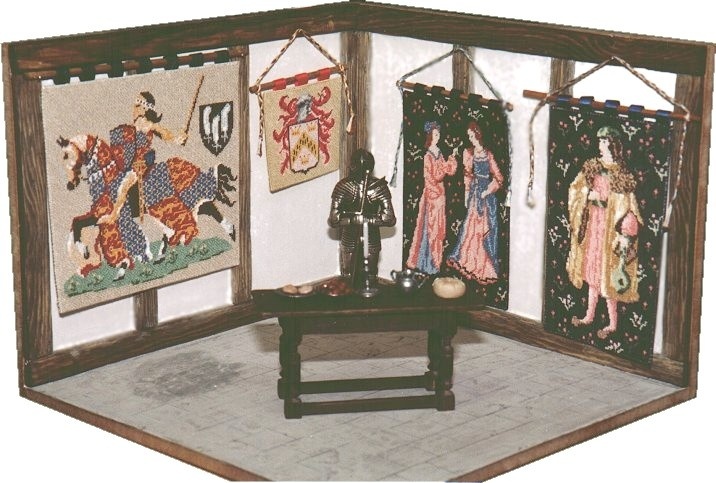 The lady, in her full-skirted dress, stands in a garden under an arbour which is covered in roses. 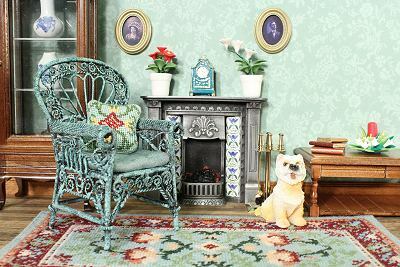 The carpet that is shown in the image below is called ‘Judith’, and is available as a kit on 18 count canvas from here. 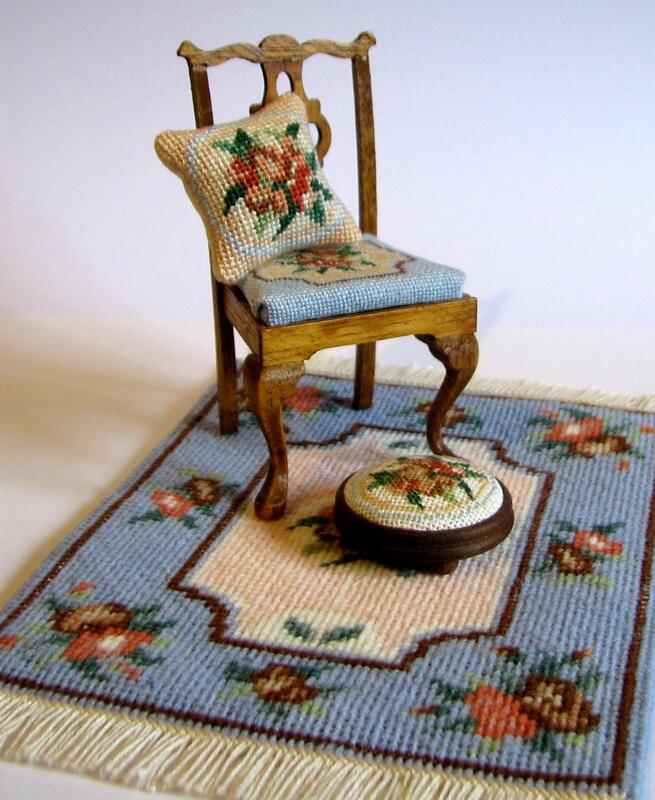 Although I didn’t design the Crinoline lady set to co-ordinate with this carpet….don’t they look good together?! 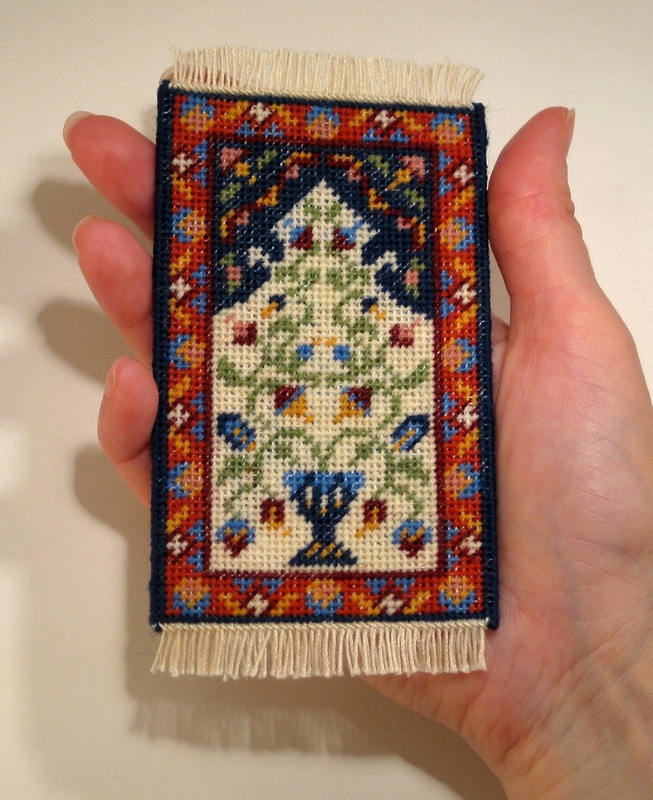 Both the table runner and the placemats are to be stitched on 32 count silk gauze, in tent stitch, which is really easy to do (it’s like half cross stitch). 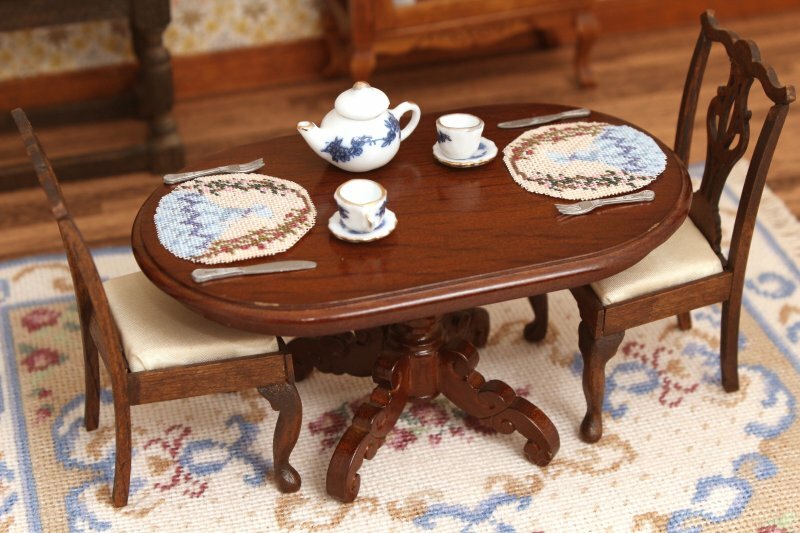 The placemats are 1 3/8 inches across, and the table runner is 3 7/8 inches long by 1 3/8 inches wide. 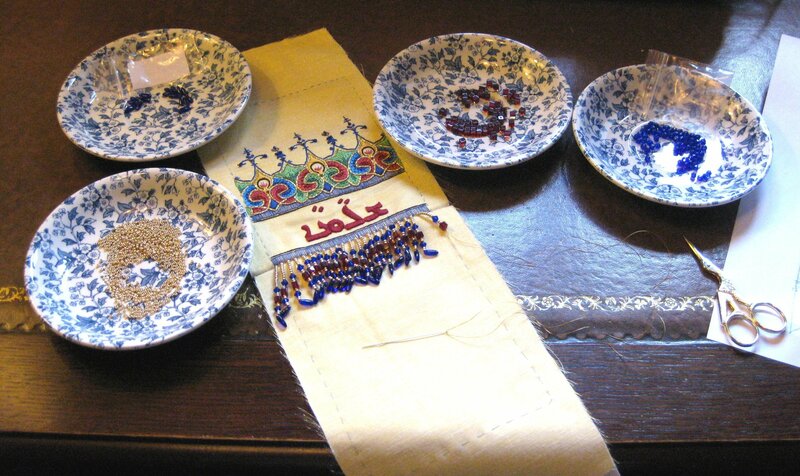 The kit for the placemats contains enough materials to make four placemats. 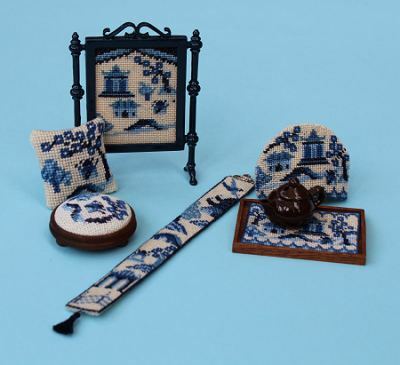 The placemats kit can be found here and costs £14.95, and the table runner kit can be found here and costs £12.95. 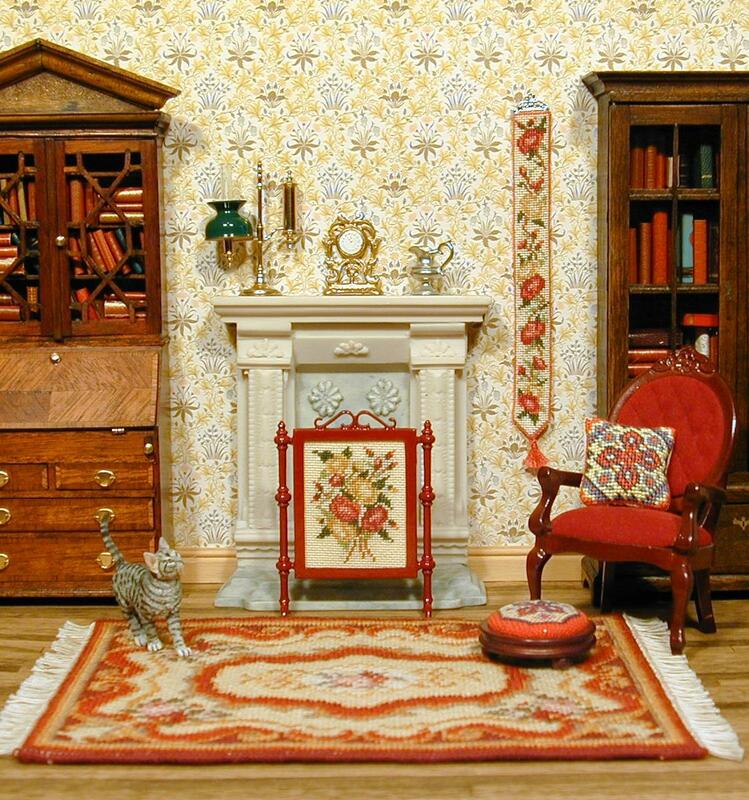 There are tutorials on how to make up each of these types of kit on my website here. 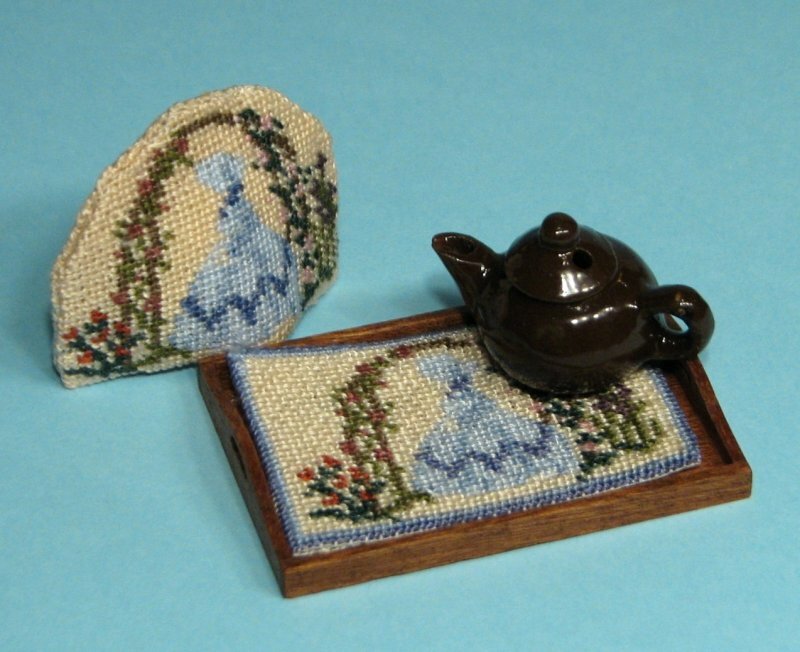 If the Crinoline lady motif really appeals to you, then there is also a dollhouse scale teacosy kit and a traycloth kit (which includes the wooden components to make the tray as well) in the same design. 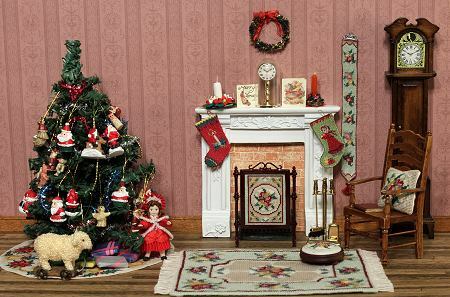 Author Janet GrangerPosted on November 6, 2014 November 12, 2014 Categories Placemats, Table runnersTags Crinoline lady, Cross stitch, Doll's house furniture, Dollhouse, Needlepoint, Placemats, Table runners2 Comments on New 1930s style dollhouse needlepoint table runner and placemat sets to make!